Materials: Mostly Metal with rubber grips. Barrel: Top venting with fully plugged barrel. 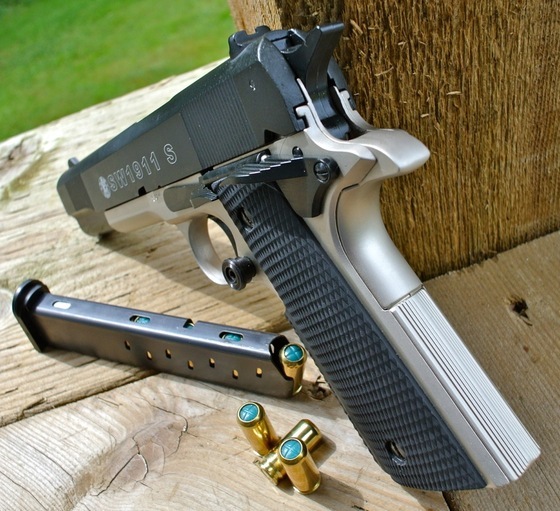 Trigger Pull: The trigger pull on the Umarex SW1911 S is actually fairly heavy which I found a bit surprising because it is a single action only gun. I found myself thinking a few times that the gun may have misfired but realised that I just needed to pull the trigger a bit firmer. This can be good in that the gun will not easily or accidentally go off and since accuracy is not a factor it is not a big deal. 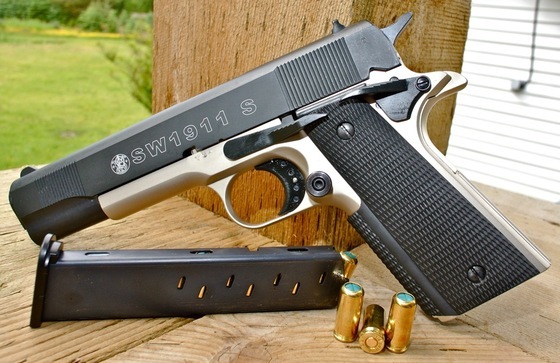 Build Quality: The overall build quality of the SW1911 S is fantastic. 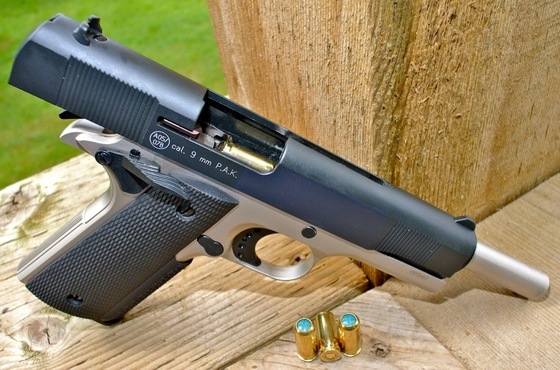 It is one of the nicest blank guns in terms of overall build quality and finish quality. The tolerances are very tight and the quality of the workmanship is top notch. When holding the Umarex SW1911 it has a lot of mass to it and feels just like a real 1911 in the hand. This blank pistol is made in Germany! Realism: The Umarex SW1911 S is a replica of a Smith and Wesson 1911 semi auto pistol but I could not find an exact match to a specific model they currently make. 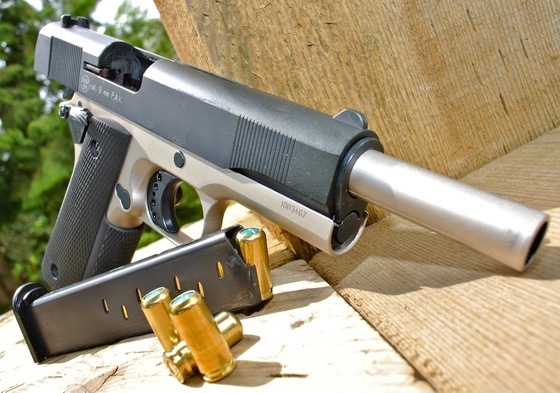 It is licensed and branded by Smith & Wesson and in terms of looking like a real steel gun it is bang on with the exception of the exhaust notch that is cut into the top of the slide. Interestingly enough I think Umarex may have not even needed to cut out this notch as my slow motion video shows that all the burn off happens before the slide even starts to move. Purchase from: The US Replica Airguns Store. Very well made, materials fit and finish is all very good. Two-tone finish looks very nice. Very true to the original 1911 - (A1 styled). Love the nice rubber wrap around grips. I was able to fit 10 rounds in the magazine (2 extra)! Notch cut out of slide takes away from the realism a bit. Magazine can be a bit tuff to get in (pressing the magazine release helps). Heavy trigger pull on mine. Even though the Umarex SW1911 S had a few shortcoming like being a top venting gun, having the notch cut out of the slide and perhaps a bit heavy of a trigger, I still really like it! The quality is evident throughout this fine German made blank gun and you can just tell it's made right. This is also my first true replica blank gun as it is fully licensed by Smith & Wesson, something that has been lacking in all my other blank guns because of our Canadian importation laws. I really wish I could get my hands on some more "replica blank guns" as I don't mind giving up the front firing for top venting to obtain a blank gun that is a true replica.